President Muhammadu Buhari on Tuesday presented an appropriation bill of N8.612 trillion for 2018. 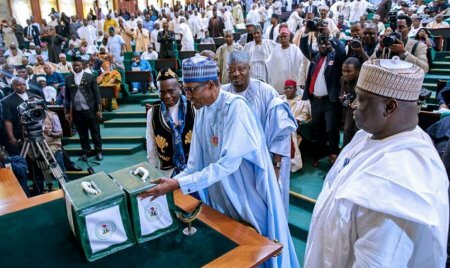 While presenting the document before the joint session of the national assembly in Abuja, the president said the budget was meant to consolidate the achievements of previous budgets. He said the 2018 budget was also to deliver on Nigeria’s economic recovery growth. The proposed budget had a 16 percent increase compared to the 2017 appropriation. Here are the estimates of the budget. • Capital Expenditure of N2.428 trillion (excluding the capital component of statutory transfers). • Niger Delta Development Commission: N71.20 billion.